At what point does a professional photographer admit that he cannot match the work of an amateur? For Geng Yunsheng, it was a few months after he had taught five peasant rice farmers in Yunnan province in China the rudiments of photography. On behalf of Greenpeace, who were anxious to celebrate sustainable farming, he had given them each a camera, and urged them to record their lives. Every month he went back to their villages, gave them new film and took away the old. 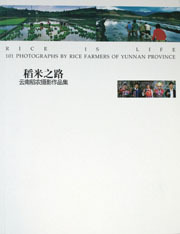 After a year he had several thousand pictures, 101 of which have now been printed in a slim book to express the beauty and hardship, the joy and the depth of rural life in China. They are simple enough. Five men carrying a log; an old woman being given a massage; four men ploughing a rice field like bullocks; people returning from the fields with firewood; men smoking pipes; the planting of rice; a wedding; the old looking after the young; young men relaxing after the harvest; a woman bent double. But there is a rare grace and  so unfashionable this  a true happiness and unselfconsciousness in the pictures. This portrait of peasant life expresses the hardship but also the rhythms, the satisfaction, harmony and the richness of culture and community. To see people relaxing in front of a camera is a joy, as is seeing photographers working from the inside out. With true insight, Li Mingfu, one of the farmers, also gave the simplest reason ever to take pictures: “I took them to tell the people outside what we have seen,” he said. Geng Yungsheng, the professional, tried to sum up the project. “I am greatly impressed. I may even doubt sometimes if they were really taken by the farmers themselves; but there’s nothing to doubt; the farmers are living in the pictures every day and can catch the most exciting scenes. By contrast, I as a professional am more than often failing to capture the essence. We could hardly believe these were shot by five farmers with virtually no experience of using photography. Maybe the emotion indicated in these pictures could never have been injected by professional photographers from outside the communities.” By contrast, The Human Footprint offers 300 pages of high quality aerial pictures purporting to show man’s impact on wilderness. The pictures are by the likes of Yann Arthus Bertrand, National Geographic staffers, Magnum and big US conservation photographers like Mike Fay. You know the drill: exquisite Colorado coastlines, achingly beautiful Micronesian islands, waterfalls, glaciers. Wow. Actually, the whole book stinks of money and PR. It may also have some flashy essays by expensive “thinkers” like Jared Diamond, but this is really a massive PR exercise for Cemex, the world’s third largest concrete maker who commissioned it. The editors are at pains to say how wonderful and careful the company is, but it is all American corporate greenwash. The fact is that Cemex mixes 98 million tonnes of cement a year, is responsible for vast areas of land being dug up for gravel and is a mighty emitter of carbon dioxide. To then commission a lush coffee table book about the beauty of what is left of wild nature is outrageous, and those who have taken money from it should give it back at once. 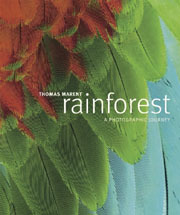 By contrast again, Thomas Marent, a Swiss photographer, lives and breathes rainforests, and has come close to death in them. He has put together an astonishingly rich portrait of these wet, magical places and has captured their uniqueness and convoluted ecology. Here, in several hundred portraits, are rivers flowing like milk; insects and flowers of unimaginable shape and size; parasites, pathogens, masters of deception and disguise, ants and reptiles. The only life form in the forest missing from Marent’s world, it seems, is man. This is a shame, because tens of thousands of indigenous peoples have made these forests that stretch over one sixth of the world their home, and to some extent have shaped them and defended them. They deserve to be recorded with the same passion and sensitivity.